Six months after taking up the sport, a visually impaired man won a gold medal last month in a national weightlifting championship. Gokhan Taspinar now aims to be world champion. Taspinar, who lives with his family in Altinordu district in northern Ordu province, harvests hazelnuts, an important agricultural product of the region. He lifts hazelnuts collected from the family's trees in sacks to the terrace of their house, which helped build up his body. 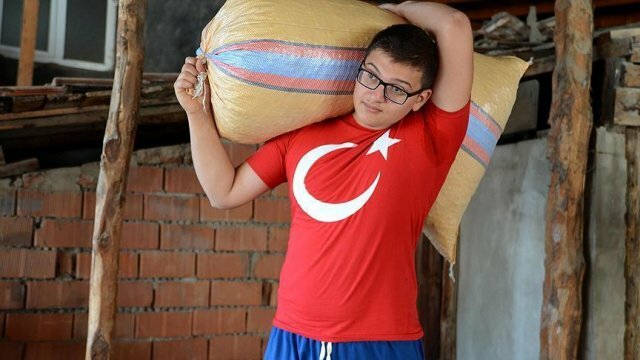 Taspinar, 21, began taking part in sports activities at the Ordu Visually Impaired People’s Sports Club and moved to weightlifting. Six months after he started weightlifting, Taspinar won a gold medal in the 100-kilogram category in last month’s weightlifting championships in central Aksaray, Turkey organized by the Turkish Blind Sports Federation. Speaking to Anadolu Agency, Taspinar said he has visual loss of 90% and lives with difficulties. Before taking up weightlifting, he did heavy work at home, and this contributed to the building up of his body, he said. "Every year, I carry the hazelnuts that we have collected to our home. The sacks weigh approximately 50 kilograms. I have been carrying hazelnuts since I was 17 or 18," Taspinar said. He said there are no weightlifting facilities in Altinordu, so he trains with his own means. "I want a training place to realize my goals. I believe that I can improve myself better if there is a training place. In the future, I aim to be world champion," he added.